Two years ago I compiled a list of the top ten movies for the Fourth of July which focused on films about the Revolutionary War. Go here to view that post. Last year I compiled a list of top ten patriotic movies for the Fourth, and that post may be viewed here. This year we will focus on the top ten Civil War films for the Fourth of July. I agree with historian Shelby Foote that it is impossible to understand the United States without understanding the Civil War, and it is “therefore fitting and proper” that over the Fourth Civil War movies come to mind. 10. Ruggles of Red Gap (1935)-We begin with a non-Civil War movie with the video clip at the beginning of this post. In 1908 English Bulter Charles Ruggles, well played by actor Charles Laughton, comes to work in the American West. It is a hilarious fish out of water comedy, as Ruggles, with his culture and British reserve comes face to face with the Wild West. While living in America, Ruggles becomes interested in American history, and becomes a great admirer of Abraham Lincoln. When he recites the Gettysburg Address, the impact on his listeners is obvious, and reminds us that for Americans the Civil War will never be a matter simply relegated to books or memory, but is something that still has a vast impact on us to this day. 8. Major Dundee (1965)-Sam Pekinpah’s flawed, unfinished masterpiece, the film tells the fictional account of a mixed force of Union soldiers, and Confederate prisoners, who join forces to hunt and ultimately defeat an Apache raider, Sierra Charriba, in 1864-65. Charlton Heston gives an outstanding performance as Major Amos Dundee, a man battling his own personal demons of a failed military career, as he commands this Union-Confederate force through northern Mexico on the trail of the Apache, with fighting often threatening to break out between the Union and Confederate soldiers. Use of Confederate prisoners as Union soldiers in the West was not uncommon. Six Union infantry regiments of Confederate prisoners, called “Galvanized Yankees”, served in the West. The final section of the film involving a battle between Major Dundee’s force and French Lancers, the French occupying Mexico at the time, has always struck me as one of the best filmed combat sequences in any movie. Perhaps the most daring and successful Union cavaly raid of the war, Colonel Benjamin Grierson, a former music teacher and band leader from Jacksonville, Illinois, who, after being bitten by a horse at a young age, hated horses, led from April 17-May 2, 1863 1700 Illinois and Iowa troopers through 600 miles of Confederate territory from southern Tennessee to the Union held Baton Rouge in Louisiana. Grierson and his men ripped up railroads, burned Confederate supplies and tied down many times their number of Confederate troops and succeeded in giving Grant a valuable diversion as he began his movement against Vicksburg. John Wayne gives a fine, if surly, performance as Colonel Marlowe, the leader of the Union cavalry brigade. William Holden as a Union surgeon serves as a foil for Wayne. Constance Towers, as a captured Southern belle, supplies the obligatory Hollywood love interest. A fascinating little video on preserving the Declaration of Independence. It is of course very important that the physical document be preserved. However, it is much more important that the spirit of the document be preserved. On the Fourth of July we do not merely engage in ancestor worship. The principles of the American Revolution, immortally set forth in the Declaration, are just as important today as they were then, and almost as controversial. 2. Government deriving its just powers from the consent of the governed. A trailer for the Captain America movie coming out in July. Two superheroes have managed to become symbols of the nation: Superman and Captain America. One of the first of the comic book heroes, Superman first appeared in 1938 and helped establish the whole concept of a superhero. “A strange visitor from another planet with powers and abilities far beyond those of a mortal man”, Superman was a hit from his first publication and rapidly achieved fame around the globe, as World War 2 GIs carried Superman comics with them throughout World War II. Something for the weekend. Glenn Miller’s uforgettable version of American Patrol set to scenes of the US Army Air Corp Eighth Air Force in action during World War II. No other song I think captures the spirit better of the young Americans who fought and won the greatest war in human history. John L. Burns was an American original. 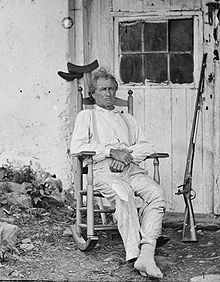 Born on September 5, 1793, he enlisted in the War of 1812 in the United States Army and fought in numerous battles in that war. He volunteered for service in the Mexican War and at the beginning of the Civil War volunteered for service in the Union Army. At age 67, it is small wonder that he was rejected by the Army. Nothing daunted, he served as a teamster for the Union Army, until he was sent home to Gettysburg where the tough old man was named town constable. The War that he had attempted to fight in followed him home to Gettysburg. When the Confederates briefly occupied Gettysburg on June 26, 1863, Burns was jailed by the Confederates for his insistence on upholding the authority of the Union as town constable. When the Confederates departed, Burns was released, and promptly began arresting Confederate stragglers. When the battle of Gettysburg started on July 1, Burns grabbed his flintlock musket and powderhorn and went off to join the fight. Running into a wounded soldier, he picked up from the soldier a new-fangled percussion rifled musket. Attaching himself to the 150th Pennsylvania, Burns fought in McPherson’s Woods. In the woods Burns joined the stand of the Iron Brigade. The soldiers at first laughed at this grandfather who was so eager to fight, but their laughter turned to admiration as the old soldier turned out to be a sharpshooter, at one point shooting a charging Confederate officer off of his horse. Burns fought throughout the day, receiving wounds in an arm, legs and breast. Being left behind during the Union retreat, Burns was able to convince the Confederates that he was a noncombatant and had his wounds treated by one of their surgeons. We at The American Catholic like to keep an eye, frequently jaundiced, on popular culture. One recent development that I enthusiastically endorse are videos posted by individuals on Youtube discussing “book hauls”, books that they have recently purchased. I find this heartening. I have always regarded myself as a hopeless book addict, and now I learn that my addiction is socially acceptable, perhaps even cutting edge! This post will therefore tell you about a book haul I made yesterday, but first a bit of background information. When I was growing up in Paris, Illinois, my mother and father used to give me and my brother a dollar each as our allowance. (Considering that between them my parents brought home about a $100.00 a week, I thought the allowance was rather generous. ) My parents expected us to clean the house each day before school, to do the dishes and to run to the grocery store to pick up items during the week. It was emphasized to us that the allowances were not payment for our work. We worked at our chores because we were members of the family, and our parents gave us our allowances because we were members of the family. You could do a lot with a dollar when you were a kid in the sixties. Comic books cost 12 cents, cokes were a dime, candy could be purchased for a nickel to a dime. However, I spent a fair part of my money at the local Goodwill. Paris did not have a bookstore, but the Goodwill had a bookcase with used paperbacks and hardbacks. The paperbacks were a nickel and the hardbacks were a dime. New used books came in fairly frequently. Most Saturday mornings I would go into the Goodwill and search through the books. It was there I first made the acquaintance of Plato, Aristotle and Aristophanes. On one memorable day, the divine Dante came my way for the first time with a paperback copy of Purgatorio, and a “new life” began for me. History books were plentiful, especially on the Civil War and World War II and I gobbled them up. Thus I began my personal library, and I have some of those books to this day. And so my shameful addiction devotion to purchasing mass quantities of books as cheaply as I can began. This week I have been on vacation, and one of the activities my family engages in when we are on vacation is to haunt book sales and used book stores. Yesterday we went to a booksale in Naperville. It is a perennial, and I look forward to it each summer. My family and I picked up 28 books for $67.00 Here are the books I picked out and why I chose them. 1. Dictionary of American Military Biography-This was the find of the day as far as I was concerned. I was unaware of the existence of this three volume set. Here it was waiting for me complete. (There was another set also available, but I decided not to be piggish and left the other set for some other lucky bibliophile.) One of the three editors of the set was a legendary Civil War historian, the late T. Harry Williams. Noted authors contributed bios to the three volumes, including the late Jay Luvaas, another distinguished Civil War historian. The bios are not squibs but full blown essays, and I will have much reading pleasure making my way through these 1200 pages. 2. Ben Gurion and the Birth of Israel-Part of the Landmark series put out in the Sixties on historical topics for young readers. I have been collecting these for years and had never seen this volume before. The book was published in 1967 and is in mint condition. 3. Shadow Knights: The Secret War Against Hitler-Part of a recent series which produces history books that are accurate in a pulp fiction format. Excellent for history minded teens that need to be convinced that history need not be dull. 4. Union 1812-A recent book on the War of 1812. There has been a resurgence of interest lately in the War of 1812, a trend that I welcome. Our Second War for Independence was far more important to our history than is commonly thought, as many of these recent histories point out. 5. The Templars-More rubbish has been written about the Templars than any other group from the Middle Ages. This history is a useful corrective. It is written by Piers Paul Read, a first rate historian and an orthodox Roman Catholic. 6. Attila King of the Huns-A good biography of the Scourge of God written in 1994. 7. Russia and the Golden Horde-Being under the Mongol Yoke for centuries had a profound impact on the Russians, one that was strongly negative I think. 8. Hardluck Ironclad-Edwin Bearss is a distinguished Civil War historian. This is one of his earlier works written in 1966 and details the history of the Union gunboat Cairo that was sunk during the Civil War, and his ultimately successful efforts to raise it from the Yazoo River. 9. Kasserine Pass-The late Martin Blumenson was one of the great historians of World War II. He began his career as a historical officer attached to the Third and Seventh Armies during the War, collecting the data that would eventually be used to produce the multi-volumed official history of US Army operations in World War II, the “green books” that are available online. Here he tells the story of the humiliating defeat inflicted by Rommel in North Africa at the battle of Kasserine Pass. The Army learned a lot of very valuable lessons from that early defeat and Blumenson describes in painful detail all the mistakes that went into making Kasserine Pass a debacle. 10. Mr. Lincoln Goes to War-This book by William Marvel, who is fairly hostile to Lincoln, details Lincoln’s first year as commander-in-chief. If you listen very carefully, you might be able to hear the grinding of my teeth as I make my way through this volume. 11. A Time to Dance, No Time to Weep-The first volume of the autobiography of acclaimed Catholic author Rumer Godden, who, among other novels, wrote In This House of Brede. 12. Three volumes of The Historian, the quarterly publication of Phi Alpha Theta-The historical articles in The Historian are usually good, but the book reviews are much, much better. 13. Bug Eyed Monsters-An anthology of BEM stories, with Bill Pronzini and Barry Malzberg as editors. 14. Origins of the Medieval World– Yet another thesis as to how antiquity was transformed into the Medieval World. This one was written by Professor William Carroll Bark when I was one year of age and I will see if I find his explanation any more convincing than the myriad of others that I have read. 15. Four volumes in the Best of series-Nelson-Doubleday in the Seventies did a series where they published Best of volumes on various science fiction authors. The hook was the series that they had the stories edited by a big name science fiction author and an introductory essay by the same author. In the fourvolumes we have the Best of C. M. Kornbluth (Frederick Pohl ed. ); Leigh Bracket (Edmond Hamilton ed. ); L. Sprague DeCamp (Poul Anderson ed. ); and John W. Campbell (Lester Del Rey ed.). 16. Trips in Time-Nine time travel stories from big name Golden Age science fiction authors edited by Robert Silverberg.